I’ve just finished a rather rapid read through Jones, L. and Douglas, J. (Editors) (2012) Public health: building innovative practice, Sage Publications/Open University, London/Milton Keynes. (as an aside, I didn’t realise when I got this book out of the library that it is the course text for Open University module K311 Promoting Public Health: skills, perspectives and practice a level 3 undergraduate module). Whilst the volume is an edited volume, I sensed a really ‘challenge’ coming from the various authors prompting a new shift in public health – a push to become more ‘radical’ to move beyond ill-health prevention to wellbeing promotion. A lot of the material and debates were familiar but the volume as a whole acts as a great ‘summary’ of what I kind of knew from my experience of reading/hearing WHO ‘gurus’ but hadn’t ever read in a textbook (not that I’ve read that many public health textbooks – yet!). It includes for example the best summary I have seen of what distinguishes the medical and the social model of health (page 13, chapter by Linda Jones). the urge to ensure ‘value for money’ and ‘evidence based interventions’ make us home people in on specific “public health issues” (usually lifestyles). Commissioned/funded interventions get evaluated on whether they make ‘behaviour changes’ and tick public health outcomes boxes, but that tends to distract from the more community development/capacity building/empowerment approaches whose results are ‘less direct’ in that they support people to become empowered to reach their own health goals (not the goals set by funders) and may lead to a nebulous, intensely personally, unmeasurable sense of “improved wellbeing”. How can we ‘let go’ into the hands of the community if professionals/governments insist on setting their own criteria for success – that are so narrowly defined. tension of needing ‘public health professionals’ to give away their ‘expertise’ and therefore their unique offer to empower/support polticians and other professions (urban planners, economic developers, policy professionals) to be more health oriented in their practice and see ‘improved health’ as their business. In short, public health professionals have to aim to do themselves out of a job! policies get developed not only in silos from each other but often without real public dialogue and debate. There is a tendency for this to be seen in a linear, rational sense of expert advice and decision-making – not a more process orientation of multiple stakeholders with different, often competing, priorities. The need for deliberative democracy and ways of working that promote social learning is higher than ever if health is to be in all policies. even the ‘settings’ movement, such as healthy cities, healthy workplaces have not captured in practice the real essence of the original Ottawa charter. For example, healthy workplace schemes are often seen as a place to do health education and lifestyle behaviour interventions/nudges NOT a place where the physical, social and economic dynamics need to come together to support and enhance health – not deteriorate it. This means that transforming our approach to public health requires organisations (in England, particularly local authorities) to work in new ways, to facilitate and enable, to judge success differently. In turn this requires huge organisational development agenda led by leaders who often don’t know they don’t know, in a wider institutional context that also needs a complete upheaval. What an uphill struggle we have. <a href="http://helen.wilding.name/wp-content/uploads/2013/09/51pUWMAZ6KL._AA160_.jpg"><img class="alignleft size-full wp-image-1514" alt="51pUWMAZ6KL._AA160_" src="http://helen.wilding.name/wp-content/uploads/2013/09/51pUWMAZ6KL._AA160_.jpg" width="160" height="160" /></a>I've just finished a rather rapid read through <a title="opens amazon entry" href="http://www.amazon.co.uk/Public-Health-Innovative-association-University/dp/1446207749/ref=sr_1_1?ie=UTF8&amp;qid=1378558280&amp;sr=8-1&amp;keywords=public+health%3A+building+innovative+practice" target="_blank">Jones, L. and Douglas, J. 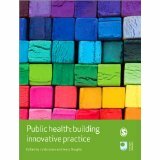 (Editors) (2012) <em>Public health: building innovative practice</em>, Sage Publications/Open University, London/Milton Keynes</a>. (as an aside, I didn't realise when I got this book out of the library that it is the course text for Open University module <a title="opens new website" href="http://www3.open.ac.uk/study/undergraduate/course/k311.htm" target="_blank">K311 Promoting Public Health: skills, perspectives and practice</a> a level 3 undergraduate module).<span id="more-1513"></span> Whilst the volume is an edited volume, I sensed a really 'challenge' coming from the various authors prompting a new shift in public health - a push to become more 'radical' to move beyond ill-health prevention to wellbeing promotion. A lot of the material and debates were familiar but the volume as a whole acts as a great 'summary' of what I kind of knew from my experience of reading/hearing WHO 'gurus' but hadn't ever read in a textbook (not that I've read that many public health textbooks - yet!). It includes for example the best summary I have seen of what distinguishes the medical and the social model of health (page 13, chapter by Linda Jones). The last chapter includes a 'table' contrasting a 'business as usual' future for public health to a 'fully engaged' future. This includes a shift of vision and values from <blockquote>"focus on lifestyle changes with variable commitment to reducing health inequalities public health partially or not integrated; different sectors continue with their own priorities values base of voluntarism; much reactive engagement" page 478, chapter by Linda Jones</blockquote> to <blockquote>"population health, health equity as national and global priorities public health integrated across social, economic and health policies values base of social justice and empowerment" page 478, chapter by Linda Jones</blockquote> But littered through the book were implicit and explicit reminders of just how 'hard' this shift is - not necessarily in terms of the ideology, but making it real within the institutional constraints of how we currently go about the way that we do things. For example: <ul> <li>public health draws from the science of epidemiology, which is concerned with the causes and distribution of diseases. The quantitative research strategies are great to look at what leads to a specific named disease or what leads to less likelihood of having a specific named disease - not as well versed in what leads to wellbeing (in its multi-faceted, undefinable sense)</li> <li>authors advocate 'systems thinking' not linear, cause-effect thinking but it seems few systems approaches are used in research of healthfulness. And very few public health practitioners or others whose work affects the wellbeing and health of populations have fully developed systems thinking and practice skills</li> <li>the urge to ensure 'value for money' and 'evidence based interventions' make us home people in on specific "public health issues" (usually lifestyles). Commissioned/funded interventions get evaluated on whether they make 'behaviour changes' and tick public health outcomes boxes, but that tends to distract from the more community development/capacity building/empowerment approaches whose results are 'less direct' in that they support people to become empowered to reach their own health goals (not the goals set by funders) and may lead to a nebulous, intensely personally, unmeasurable sense of "improved wellbeing". How can we 'let go' into the hands of the community if professionals/governments insist on setting their own criteria for success - that are so narrowly defined.</li> <li>tension of needing 'public health professionals' to give away their 'expertise' and therefore their unique offer to empower/support polticians and other professions (urban planners, economic developers, policy professionals) to be more health oriented in their practice and see 'improved health' as their business. In short, public health professionals have to aim to do themselves out of a job!</li> <li>policies get developed not only in silos from each other but often without real public dialogue and debate. There is a tendency for this to be seen in a linear, rational sense of expert advice and decision-making - not a more process orientation of multiple stakeholders with different, often competing, priorities. The need for deliberative democracy and ways of working that promote social learning is higher than ever if health is to be in all policies.</li> <li>even the 'settings' movement, such as healthy cities, healthy workplaces have not captured in practice the real essence of the original Ottawa charter. For example, healthy workplace schemes are often seen as a place to do health education and lifestyle behaviour interventions/nudges NOT a place where the physical, social and economic dynamics need to come together to support and enhance health - not deteriorate it.</li> </ul> This means that transforming our approach to public health requires organisations (in England, particularly local authorities) to work in new ways, to facilitate and enable, to judge success differently. In turn this requires huge organisational development agenda led by leaders who often don't know they don't know, in a wider institutional context that also needs a complete upheaval. What an uphill struggle we have.